National Nail Polish Day - Things Everyone Should Know! 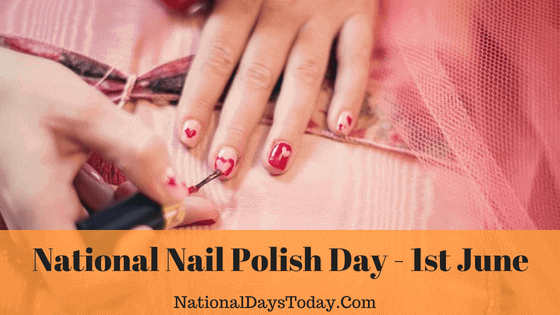 The National Nail Polish day is celebrated by women of all countries whoever possess a love for nail care and nail art. Nail Polishes are widely used irrespective of ages and considered to be a fascinated accessories of all ages. Nails with no coloring is rarely found in the United States. Different shades for a different occasion. From Vibrant to pale Colors. Especially Pink, the color that most of the women love. Thus, this day is celebrated to acknowledge the love of Women. The semi-solid gel, Nail Polish. Not More! Some shades of Nail polish are enough to celebrate this day. Use this hashtag #MyShades to post the different shades of Nail Polish that you have along with the picture. Let us spot out if you have any Unique Color. Post those unique color details using this hashtag #NailCareColors. Express your facts about the benefits of Manicure using this hash tag #manicure. Nail Art is in High demand nowadays, try to learn if your time permits. Certain things we cannot ignore. Therefore, post the impact of having your nail colored. Essie Weingarten founded Essie Cosmetics in the year 1981 in which only 12 shades of nail polish were displayed at the event. The quality standard and the catchy appearance led to the high anticipation towards Women further resulting in the introduction of several unique colors. Essie comprises of nearly 1000 shades of Nail polish and becomes the high demanded Nail polish brand. In 2010, L’Oreal, a well-known high branded cosmetic company had acquired the Essie Cosmetics. The ingredients found in the Nail polish could cause serious health consequences. The solvent phthalates present in the Nail Polish could cause endocrine and diabetes-related issues. The use of coloring agents is also a serious concern. Though, no standard to be abided in the manufacturing, most of the brands has stopped using such toxic substances. Use of Artificial Nails is more common nowadays. the grown nails that we love may break sometimes and we may terribly feel for it. However, it is unavoidable since we go out; travel in bus, drive cars, we work, these times, the Nails may gel disturbed and might break. Therefore, Artificial Nails can be used. So what if your nails broke. Go for Artificial Nails, color it, art it if you want, look better. The use of Nail Polish is dated back to 3000 B.C. The Royal Families of China started coloring the nails with Gold and Silver Colors. Later, Red and Black replaced the Gold and Silver colors respectively. As per early Egyptian Customs, the High society people used Vibrant and Strong colors whereas the Low society people used pale colors. Even at present, the most used color is claimed to be “Apple Red”. The National Nail Polish Day was founded by Essie, a brand that is expertise in Nail salon. Essie cosmetics is the preferred brand for many celebrities, professional models, beauty professionals and is the pioneer for nail polish production. The day was declared by Essie after the inauguration of Nail care session on June 1.